Malaysia Flag and Coat of Arms: The Malaysian flag, also known as the Jalur Gemilang (Stripes of Glory), and the Malaysian coat of arms are symbols of the nation's stateliness and sovereignty. The Government encourages the flying of the Jalur Gemilang particularly during the Month of Independence in August as an expression of love, loyalty, and pride for the country. 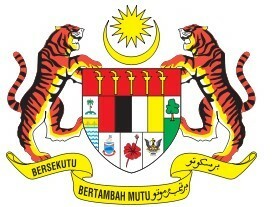 The coat of arms of Malaysia (Jata Negara) is comprising a shield or escutcheon, two tigers for supporters, a crescent and fourteen-pointed star for a crest and a motto. As the Malaysian coat of arms descended from that of the Federated Malay States under British colonial rule, it resembles European heraldic designs. Negaraku (My Country). The National Anthem’s role is not only to arouse patriotism among the Malaysian people, it represents sociocultural and even posted remarkable ambitions, desires, and expectations of the country. Negaraku was named the national anthem. The lyrics are calling on the people of various races, religions and socio-cultural life of unity and pursue a variety of advances. Besides this song begs mercy and happiness of God for the welfare of the people and our beloved country Malaysia. National anthem beats moderato originally the same as most other countries in the world monarchy. Malaysia experiences hot and humid weather throughout the year. The average daily temperature throughout Malaysia is between 21˚C to 32˚C. Typically, the Malaysian climate is influenced by winds blowing from the Indian Ocean (Southwest Monsoon Wind-May to September) and South China Sea (Northeast Monsoon Wind-November to March). Its annual rainfall is 80 percent per year ranging from 2000mm to 2500mm. The estimated population of Malaysia in 2018 is 32.4 million (including non-citizens) as compared to 32.0 million in 2017 with an annual population growth rate of 1.1 per cent. Population of citizens in 2018 is 29.06 million and 3.32 million non-citizens. Malays and Bumiputeras comprise 69.1% of the population, followed by Chinese (23%), Indian (6.9%) and others (1%). Islam is the most widely professed religion in Malaysia with the proportion of 66.72 per cent. As a multi-racial nation, other religions embrace are Buddhism (17.92%), Christianity (8.96%) and Hinduism (5.12%). Malaysia is a confederation of 13 states plus the three Federal Territories which are Kuala Lumpur, Labuan and Putrajaya. The Capital of Malaysia is Kuala Lumpur and Putrajaya is the seat of Federal Government. Nine of the peninsular states have Sultans and every five years an election is held among them to choose 'Yang Di Pertuan Agong' or 'King' of Malaysia. The politics of Malaysia takes place in the framework of a federal representative democratic constitutional monarchy, in which the Yang Di Pertuan Agong' is the head of state and the Prime Minister is the head of government. Executive power is exercised by the federal government and the 13 state governments. Federal legislative power is vested in both the government and the two chambers of parliament, the Senate (Dewan Negara) and the House of Representatives (Dewan Rakyat). The judiciary is independent of the executive and the legislature, though the executive maintains a certain level of influence in the appointment of judges to the courts. The Malaysian education system encompasses education beginning from pre-school to university. Pre-tertiary education (pre-school to secondary education) and tertiary or higher education are under the jurisdiction of the Ministry of Education (MOE). The Government provides more than 95% of primary and secondary education as well as about 60% of the tertiary education, with the private sector providing the balance. Private Educational Institutions (PEIs) which provide education at preschool, primary and secondary levels. They comprise private schools and foreign system schools. Private Higher Educational Institutions (PHEIs) which provide tertiary education leading to the awarding of certificate, diploma and degree qualifications. 3. Increase in reporting of occupational diseases and poisoning among workers by 30%. •	To study and review the policies and legislations of occupational safety and health. •	To conduct research and technical analysis on issues related to occupational safety and health at the workplace. •	To carry out promotional and publicity programs to employers, workers and the general public to foster and increase the awareness of occupational safety and health. 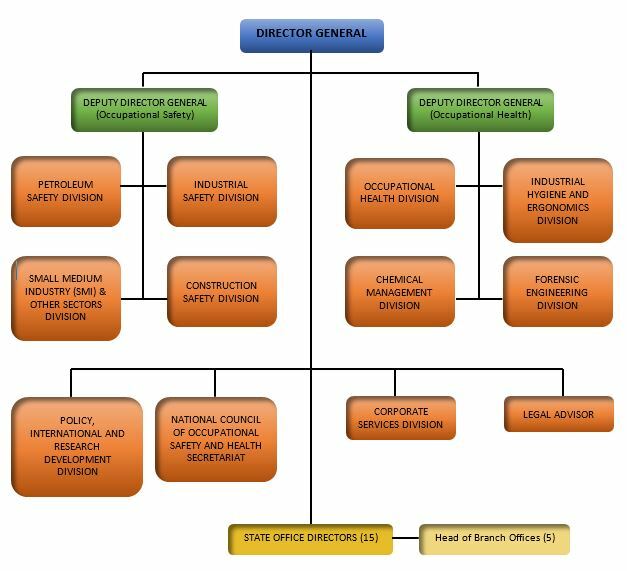 •	To become a secretariat for the National Council regarding occupational safety and health. Studies on existing OSH policies were conducted from time to time to assess the extent to which these policies had achieved their original objectives. Changes would be made, if necessary, to ensure that the goals and the practice of self-regulation among employers and employees were achieved. •	Collecting and providing informational materials on occupational safety and health for reference, lending, and dissemination.